The Super W Pad is one of the thickest most versatile and efficient pads available. Noise and vibration control pads should be relied upon only as a noise break and minor vibration control to be placed between equipment and a stiff support surface. Significant vibrations require "tall" rubber or spring mounts that yield higher deflections. 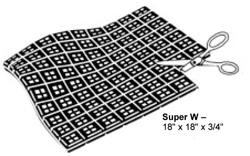 Super W Pads should be used in 2" x 2" squares. 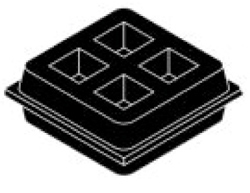 Select the minimum number of squares required and design pads to the most convenient shape. The use of additional squares results in more conservative loading. Example: Load is 700 lbs., capacity is 120 lbs/square.700/120 = 5.83 squares.Use 6 squares configured as 2 squares by 3 squares (4" x 6")or 1 square by 6 squares (2" x 12"). Neoprene for longer life and moderate oil resistance. In 3/4" thick pads only. Bridge-bearing Neoprene for maximum life, excellent oil resistance and resiliency approaching natural rubber. Available in 3/4" thick pads only. Standard 18" x 18" sheets consist of 81 - 2" squares each supporting 120 pounds. The squares are separated by a thin web that is easily cut to provide evenly dimensioned pads such as 2" x 2", 2" x 4", 4" x 4", 6" x 8", etc. Super W Pads out perform cork and rubber "sandwich" pads by giving longer life and greater resiliency with consistent and reliable service.